The hazards of poor oral health and increased likelihood of cardiovascular disorders were highlighted at the EuroPerio8 Conference, held recently in London. This international gathering attracted almost 10,000 delegates. Periodontitis, the inflammatory condition affecting the tissue surrounding and supporting the teeth (the periodontium) appears to be a major culprit. This is linked to development of systemic inflammation, with raised levels of biomarkers such as C-reactive protein and Interlukin-6 (IL-6), which in turn are associated with increased rates of atherosclerotic cardiovascular diseases (ACVD) including stroke, and myocardial infarction. 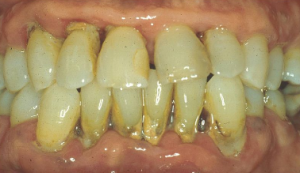 Studies in the literature implicate a number of possible mechanisms that could be responsible for increased inflammatory responses in atheromatous lesions due to periodontal infections. These include increased systemic levels of inflammatory mediators, such as above, stimulated by bacteria and their products at sites distant from the oral cavity: elevated thrombotic and haemostatic markers that promote a prothrombotic state and inflammation: cross-reactive systemic antibodies that promote inflammation and interact with the atheroma, promotion of dyslipidaemia with consequent increases in pro-inflammatory lipid classes and subclasses, and common genetic susceptibility factors present in both diseases leading to increased inflammatory responses. Such mechanisms may be thought to act in concert to increase systemic inflammation in periodontal disease and to promote or exacerbate atherogenesis. However, proof that the increase in systemic inflammation attributable to periodontitis impacts inflammatory responses during atheroma development, thrombotic events or myocardial infarction or stroke is lacking. While a cause-and-effect relationship has not yet been proven, research has indicated that periodontal disease increases the risk of heart disease and that inflammation caused by periodontal disease may be responsible for the association. Swedish workers have also shown that the number of teeth present is related to atherosclerotic plaque in the carotid arteries of elderly patients and is another possible risk for cardiovascular disease. The high prevalence of cardiovascular disease and periodontitis in individuals with diabetes may also be attributed to an increased inflammatory response leading to atherosclerosis that is usually more extensive and that develops at an earlier age compared to those without diabetes. Although studies have reported separately on associations of periodontitis and diabetes and periodontitis and coronary heart disease, the impact of periodontitis on progression of cardiovascular disease in individuals with diabetes has not been extensively investigated. It appears that the extra risk posed by periodontitis is greater for cerebrovascular disease than for coronary heart disease, and is also greater in males and in younger people (studies show no increased risk in individuals aged 65 years or more).